Mention Grasmere anywhere in the World and the first thing people usually say is “Oh that’s where the gingerbread comes from” followed by “and didn’t Wordsworth use to live there”. 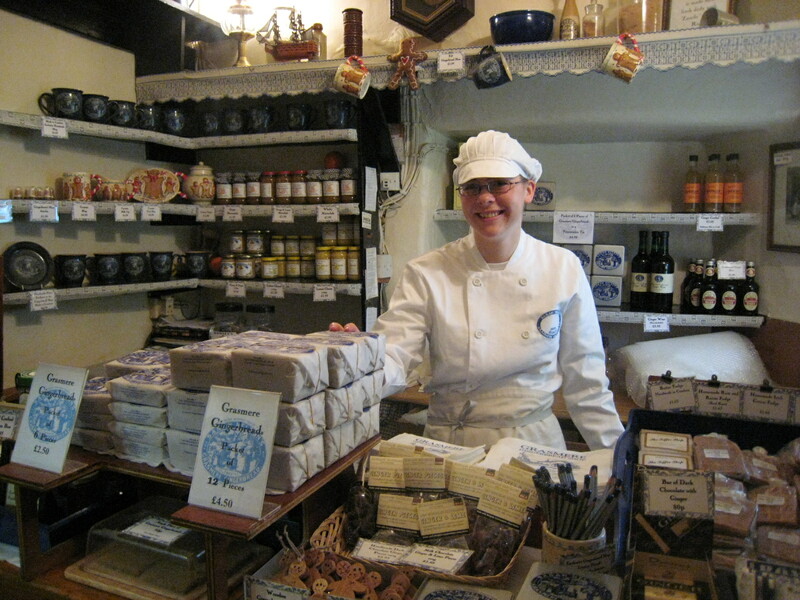 Happy at work, Grasmere Gingerbread Shop. 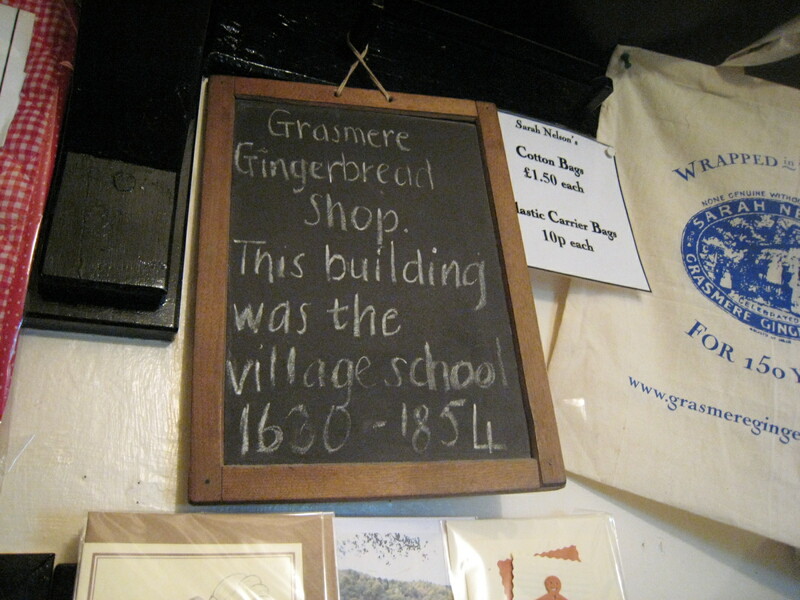 Situated in a little shop in the corner of Grasmere Churchyard, both the gingerbread and the building have an interesting history. 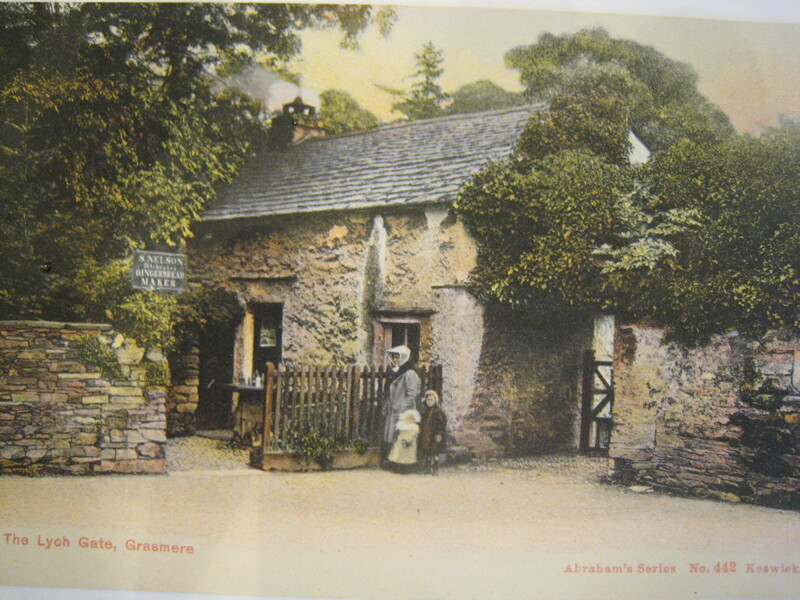 I collect old postcards of Grasmere and have one of the Gingerbread Shop as it used to be in about 1860. Old Postcard, Grasmere Gingerbread Shop. The building was originally known as Gate Cottage built about 1630, and served as the village school. This was at a time when education wasn’t compulsory and locals paid a penny a day for their boys to attend. William Wordsworth actually taught at the school and his children attended it. 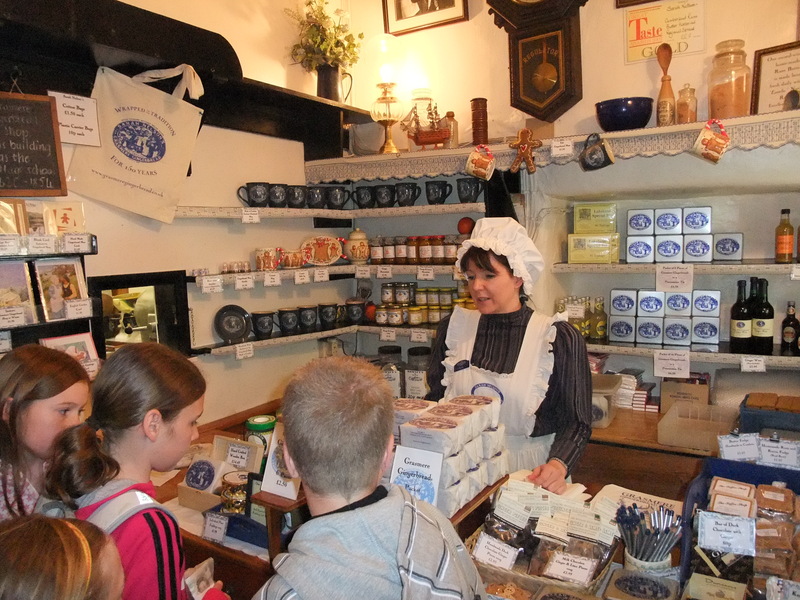 Many of the fixtures and fittings in the gingerbread shop come from the school. 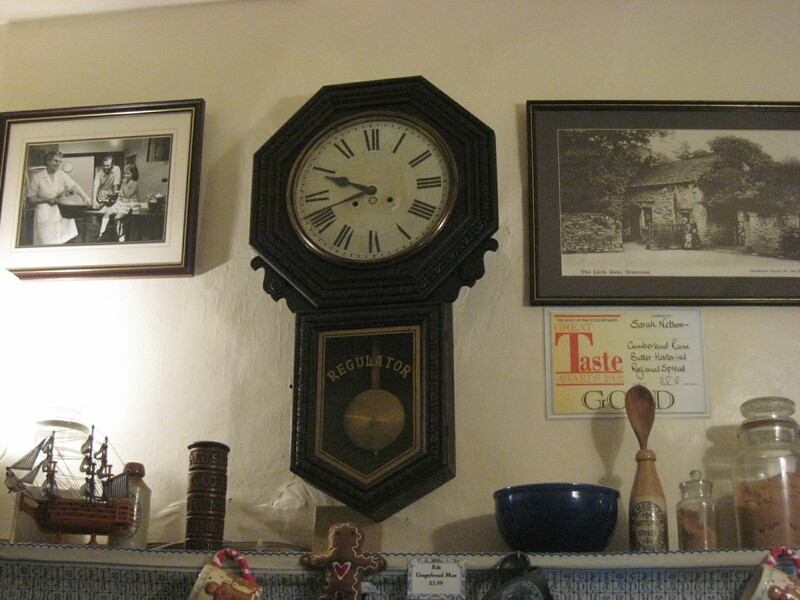 This clock originally cost two shillings and sixpence. When Education did become compulsory a new school was built and the Nelson family took over the tenancy, in about 1854. Sarah Nelson had previously worked for Lady Farquhar who lived in Dale Lodge at the time and she was encouraged by Lady Farquhar’s chef to set up her little business. 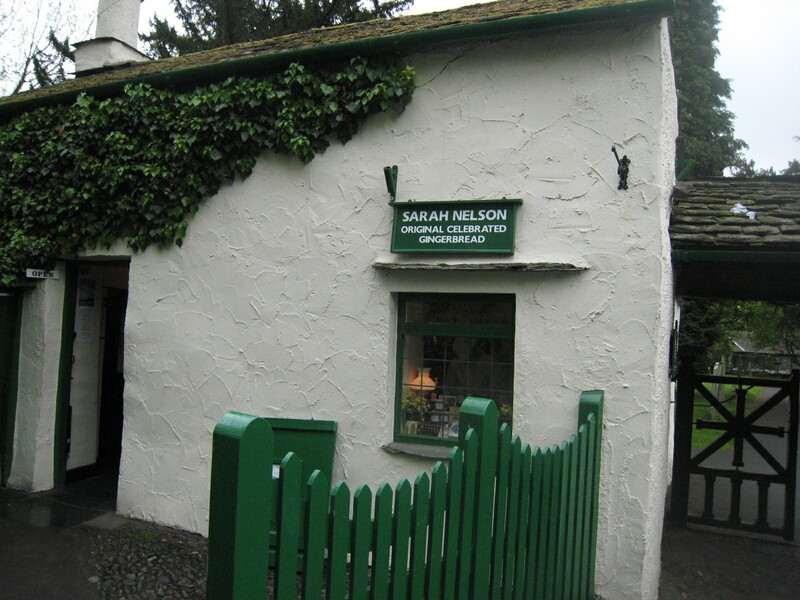 Sarah used to sell Helvellyn cake, aerated water and of course her special recipe of Gingerbread. 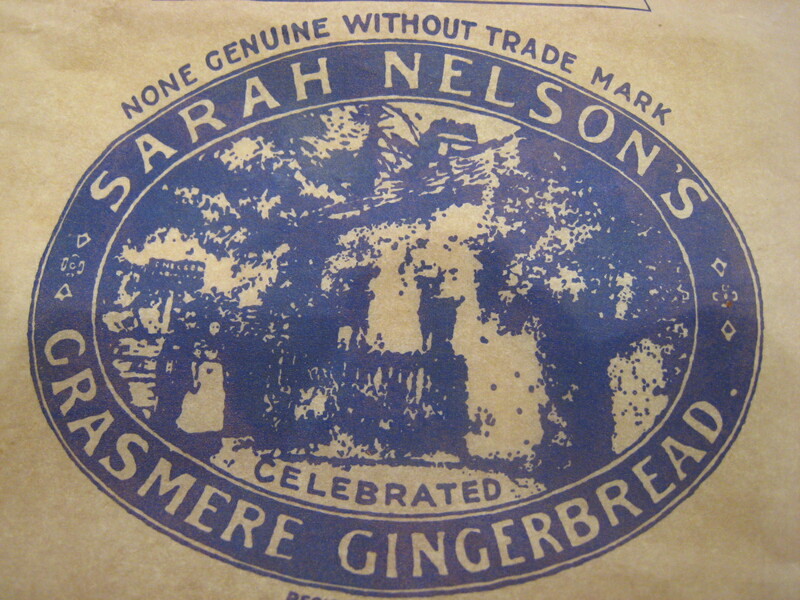 Almost from the start she wrapped the gingerbread in pure vegetable parchment printed “None genuine without trademark”. The Gingerbread is still wrapped in parchment and sealed with a rubber band. The packaging really appeals to the Japanese and other lovers of our history and heritage. Eager customers, Grasmere Gingerbread Shop. There is always a queue from morning till closing time at the Gingerbread shop. Because of the size of the building it quite often snakes outside and along the street. While Andrew and his team do their best, baking it fresh every morning, it can run out, so an early visit is recommended. And if you enjoy it, you still have time to go back for more!. I wonder how many hungry faces have peeped in this window over the years. Many famous visitors have graced it’s steps. 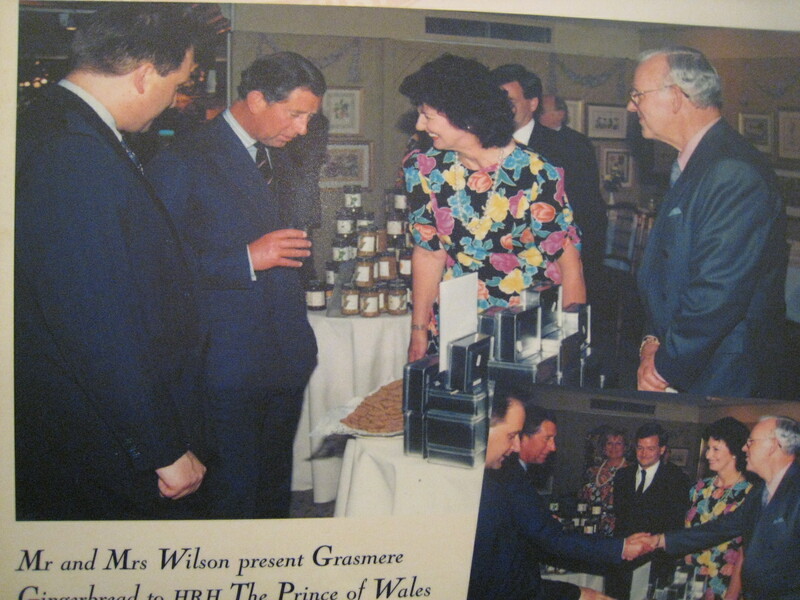 TV chef Phil Vickery actually used to work as a trainee chef in Grasmere years ago and has always had a soft spot for Grasmere Gingerbread and includes it in his list of “Best of British Produce”. Another chef to praise it is Jamie Oliver who said “Grasmere Gingerbread is the best i’ve eaten” . Grasmere attracts many famous folk, Tom Cruise, Nicole KIdman and Alan Whicker have all visited at some time. 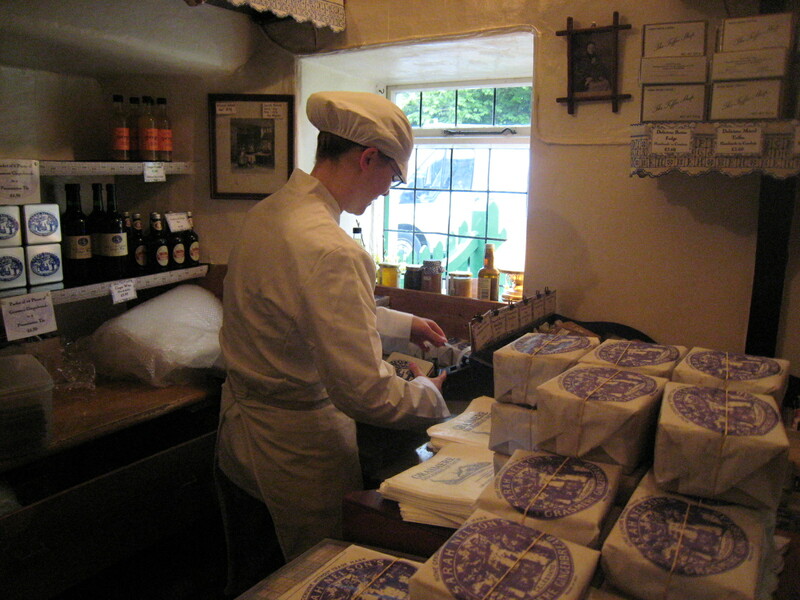 Grasmere Gingerbread is posted all over the world and it really is a full time job wrapping and packing it. 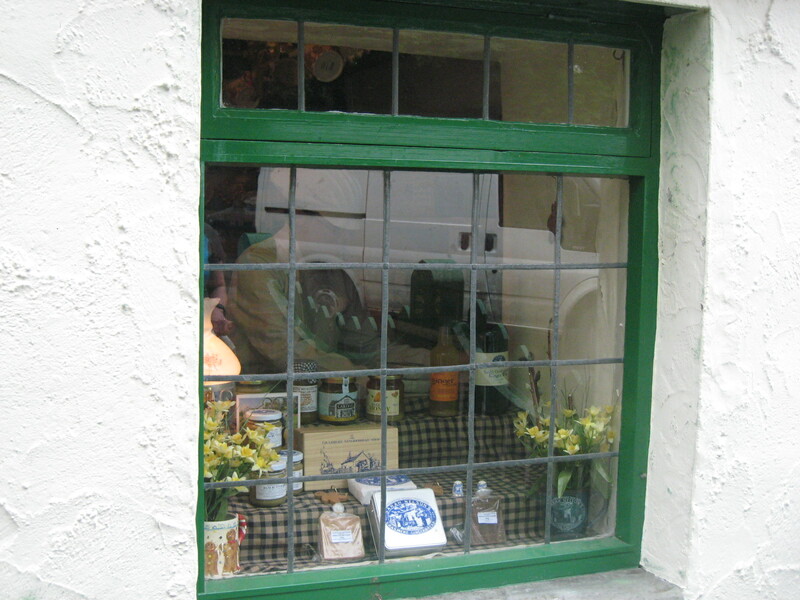 This little shop is the only place where you can buy the genuine article. And no matter how hard you try to recreate it, it never tastes the same. The recipe is a secret and is stored in the bank vaults at the NatWest Bank in Ambleside. Every one has there own way of enjoying it. My favourite is to make a lemon cheesecake base with it, delicious!. Enjoy with a cup of tea or a whisky or of course enjoy it just on it’s own. I’ve managed to eat a whole packet while writing this, thanks to Andrew, the “Gingerbread Man”. But my excuse is, ginger is good for you. A last personal tip. Anytime I am travelling by boat I always take a bit to nibble. We were once the only ones not seasick on a trip across the North Sea. Thank you Grasmere Gingerbread!. Literally just back from the Lakes today – walked around Grasmere on Friday and even though I have visited many times I really wish I had seen this first. I shall bookmark it for when I can come back up! Glad you enjoyed reading. Hope it’s not too long till you can visit the Lake District, and of course Grasmere again.